It’s a big week for Arena of Valor professional play, meaning it’s been yet another quiet one for the more casual playerbase. As Tencent continues in its attempt to create another eSports hit, Elsu remains to be seen on the Western servers. We’re still a week away from his amended November 16th release date, but those hoping the development team would usher things are only going to be disappointed. Whether Tencent decided to push the release date back to avoid any kind of Valor Series 2 playoff conflict is anyone’s guess, but the timing does point to more than just a bugged champion at this point. “Slam in Sao Paulo” Playoffs Have Begun! Going by our usual publish date, the Sao Paulo Playoffs – the final leg of Valor Series 2 – is very likely already underway. The culmination of eight weeks of competitive play, the “Slam in Sao Paulo” competition sees the top 4 teams of each region battle it out for their share of a massive $200,000 prize pool. After that, the winning team of each region will move onto the qualifying round of the Arena of Valor International Championship 2 weeks later on November 23. That’s right, after 8 weeks of competition, the winning teams will still need to battle it out against the rest of the world to even stand a chance at entering the big leagues. Americans watching the show will be able to root for home-grown teams like Allegiance, Tribe Gaming, Pridestark Empire, and VeniVidiVici, with Europe cheering on Bubble Team, Nova Esports, Team Queso, and Dead Rabbits. Signifying the first solely Latin American teams of the Arena of Valor esports comes GeOeSports, PaiN Gaming, Assassin’s Crew, and the second team of Nova Esports who miraculously managed the same win/loss standing as their European counterparts. All the action unfolds on Facebook of all places, so you’ll need to head over to that neck of the woods for your Valor Series 2 Slam in Sao Paulo coverage. Being based in South America, you’re looking at a 5:15 AM PST start time that will pit EU teams Bubble Team and Dead Rabbits against each other, before doing the same with Nova and Team Queso. The winning team of each match will face each other in their region’s final. Arena of Valor on Nintendo Switch likely hasn’t been the blowout success Tencent had anticipated after that August 2017 Nintendo Direct reveal. Between a 12-month release schedule, performance issues, and lackluster marketing, players have been complaining of longer than average queue times and a lack of comparable content compared to the mobile version of the game. Further fuelling the fear of Tencent tossing the title out as an afterthought came hastily written patch notes that did little to fix the underlying crashing issue. This week, things looked a little better with a slightly more player-focused patch; but it’s still too little too late for the already fragmented Nintendo Switch playerbase. Following on from a patch last month aimed at correcting the game’s numerous crashing issues, yesterday’s Nintendo Switch patch took a light stance on balancing some of the game’s more prominent heroes. Valhein was the first to get knocked down with longer cooldowns, less damage scaling, and a more straight-forward movement speed boost stemming from his already powerful ultimate ability. Likely stemming from the hero’s surprisingly high win rate during the Valor Series matches over the last few months, Slimz has also received similar nerfs to his toolset, hopefully encouraging Nintendo Switch players to try out some new ranged characters. We’ll likely see far more balance changes pushed out over time, but the smaller hotfix-style patch seen this week suggests the team put in charge of the Nintendo Switch version of the game won’t wait for larger monthly updates to tweak characters, something mobile players have complained about in the past for allowing game-breaking bugs (like Super Rourke) to ruin the gameplay experience for far too long. Arena of Valor’s Reddit community isn’t happy about the current state of the game, and they’ve begun petitioning for change. Using the Change.org online platform as their proverbial rooftop from which to shout from, the petition has tripled its signature count over the last few days. Though that still only means slightly upward of 100 people have joined in thus far. Published overnight on Tuesday, November 6, around 40 players had signed the form in the first 6 hours. Fast forward to Thursday afternoon and that number had jumped to 126. It may not sound like much (and probably isn’t anywhere close to the number needed to catch Tencent’s attention), but with Arena of Valor being a mobile-based game, there are grounds to assume the vast majority of its playerbase isn’t actively involved in the community over on the game’s subreddit. 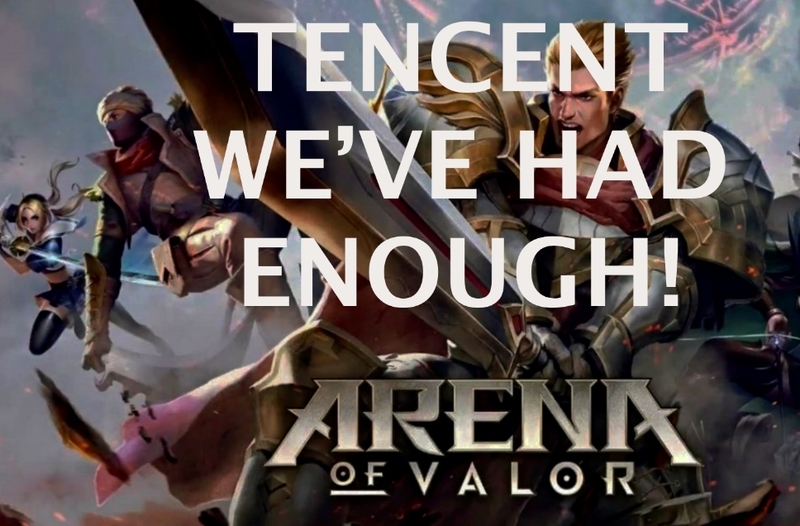 It’s a vocal minority for sure, but with those players agreeing in favor of arguments like high hero/skin prices, the lack of a real community manager, and some shoddy customer support practices, it’s clear not everyone believes Arena of Valor in the most capable hands right now. We can imagine it will be business as usual during the Sao Paulo playoffs this weekend, but the fallout of former community manager Nick Zazowski is being felt across the game right now, and it’s a hole that needs to be filled sooner rather than later.